Climate variability and change are determined by the functioning of the Earth’s physical, chemical, biological, and human systems and the interactions among them. Observations of these systems are key to our understanding of climate, yet on their own, observations are unable to address a wide range of questions that are essential for interpreting past changes and anticipating the future. Relevant question include “Why is the system changing the way it is?” and “What changes can be anticipated in response to specific policy decisions?” Reliable guidance on these questions is needed to better inform society and this is the core motivation for Earth System Modeling. Earth System Models (ESMs) are tasked with simulating the physical, chemical, biological, and human components that govern the climate system. They quantify the certainties and uncertainties in changes on timescales up to centuries and longer. ESMs typically consist of 4 core components, encompassing the atmosphere, land surface, ocean, and cryosphere. They are developed based on established physical laws and continually scrutinized against observations, process-based knowledge, and climate proxies from the distant past with the objective of increasing confidence in the guidance they provide. 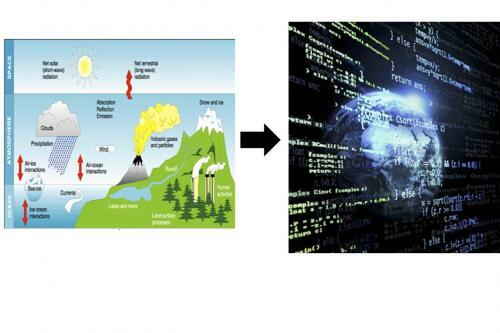 Aided by global-scale observations provided by satellite and in-situ observing systems and massive increases in computing power, the advances made in Earth System Modeling in the past decade have been unprecedented. In our work, we use a state of the art GCM to explore variability in the water cycle with an emphasis on prolonged drought and its root causes. Specifically, our work makes use of two recent ensemble modeling projections at the National Center for Atmospheric Research (NCAR) using the Community Earth System Model (CESM). These projects, the CESM1-CAM5 Last Millennium and Large Ensembles, are unprecedented in their scope, spanning 850-2100 and 1920-2100, respectively, with more than 30 ensemble members allowing for investigation of a broad range of issues. A range of prescribed forcings is also used (i.e. solar, greenhouse gas, volcanic), and runs are performed with combined- and single-forcing configurations, allowing for attribution of past changes, particularly in regards to drought frequency, intensity, and duration.